In April, Jenner sat down for an interview with Diane Sawyer to reveal that the former Olympian had the “soul of a female.” While many praised Jenner for coming out, there was still quite a bit of controversy over the announcement, and many media outlets continued using male pronouns to describe Jenner. These Vanity Fair cover is the first official photo of Jenner after feminization surgeries. Bissinger spent hundreds of hours preparing for the article release, both before and after some of Jenner’s surgeries. The article details the hopes that Caitlyn has for her future, and the struggle she has had with her children during her transition. 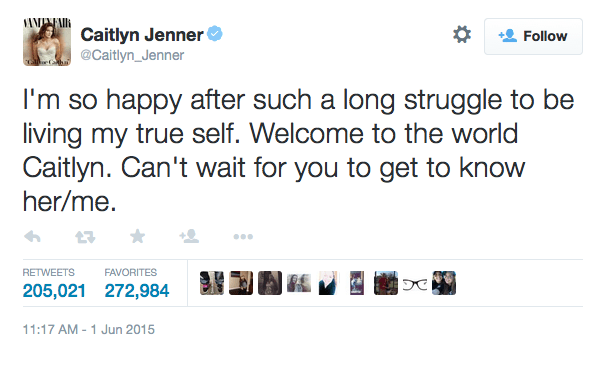 Jenner states that she expects her future to be happier now that she is being open about herself. Jenner’s debut was met mostly positively. In fact, Caitlyn Jenner’s twitter has broken records already, helping to cement her newfound icon status, Caitlyn Jenner just set a new record for the quickest to reach one million Twitter followers. Jenner broke the record in four hours, beating out President Obama, who set the last record only two weeks ago, reaching a million in about five. 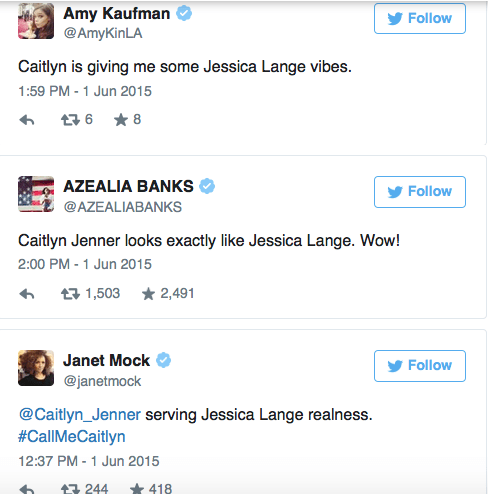 People were quick to point out the comparison’s between Jenner and actress Jessica Lange, who is most recently known for her work in American Horror Story. The comparison is certainly there, especially with Caitlyn’s stylish wardrobe and voluminous hair. Lange’s name was trending on Twitter on Monday because of it. When The Daily Beast broke the news of the comparison to Lange, she said, “That’s so wonderful. Well now I’m going to have to look for that picture.” While Lange hasn’t seen the cover yet, and doesn’t know what it means to be trending, she seemed excited about the idea. Despite some negativity from more conservative sites, such as Fox, most of the media seems to understand what a huge step this is for transgender representation in America. GLAAD President and Chief Executive Officer Sarah Kate Ellis hailed the Jenner cover. “By sharing her journey with the world, Caitlyn Jenner is accelerating acceptance of transgender people everywhere and reminds us all how important it is to live as your most authentic self,” Ellis said in a statement. We are so excited for Caitlyn Jenner’s debut and the work she is doing for transgender people. We wish her and her family all the best.